I think especially with the amount of work and money that would go into said projects I'd have no problem and would encourage ways to make things more feasible. I'd much rather have a project come to fruition with welded trucks instead of casted if that meant that the project would actually happen for instance. The sad reality is we can't go back and just transport much of this stuff to the present time so I think we just do the best we can. And in ALCO's case anything that helps bring ALCO's legacy to future generations is a huge win to me. 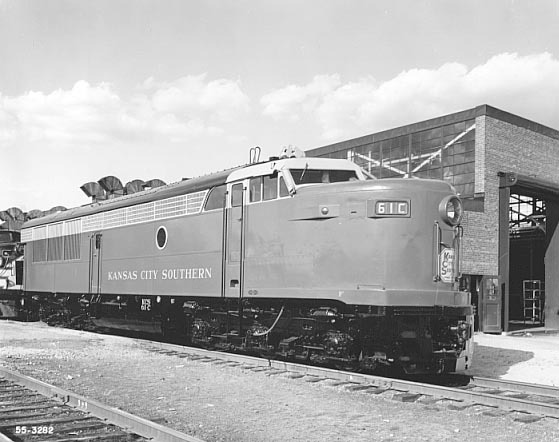 Mind you, if the "extinct species" you wanted to revive was the FM/GE "Erie Built" instead of the Dl-109, welded trucks might be authentic: some Eries had cast trucks similar enough to those of an Alco PA's to be used under Doyle McCormick's restored PA, but others had a GE designed welded-fram truck that… looks like nothing else, but seems to have been, mechanically, similar to an inside-out version of EMD's E-unit truck! Ooh, an Erie-built would be cool to have, and you could build it with a dual-fuel 9-38D8⅛ (FM doesn't make the 10 cylinder anymore) engine to meet emissions. I know it'd be a small price to pay for a new Erie-Built, but the welded trucks are kind of hideous, haha. As for welded trucks, the Gennies have them, but you'll recall that they also had issues with cracks a few years back. Probably an Amtrak issue more than a GE/Vossloh (supplier) issue though. I've only done a little welding and only know a bit more, but suffice to say that welding and heat treatment have come a long way since the 1950s. I remember reading somewhere that I believe it was NRE was going to start building Alcos. The timeframe was in the late 1990s, and I forgot what the source was, where I saw the information. At the time, I was holding a job on BN out of Barstow, IL. We used to go by the ex RI Silvis shop complex. At the time, they had a large fleet of ex CN Draper carbody Alco/MLW/Bombardier units. This made me wonder if they were somehow to be cores for new Alcos. I don’t know this for sure, as thy could easily just be what happened to be traded in. Furthermore, I don’t know if the plan would have been converting them to hood units, but still rated at 3000 hp. Maybe someone could enlighten me as to whether the 16-251 is now capable of 4000 hp, as opposed to CP’s 18-251, of the 1970s. Engineer Spike wrote: Maybe someone could enlighten me as to whether the 16-251 is now capable of 4000 hp, as opposed to CP’s 18-251, of the 1970s. Fairbanks-Morse no longer has any info on the 251 on their web site, but I seem to recall that the 16-251 was available at 4000 HP for stationary and marine applications when I looked at the spec sheet on their web site a few years ago. The version used in the VIA Rail LRC locomotives was rated at 3700, which isn't that far from 4000, and that was almost 40 years ago. It's reasonable to think that it could easily produce 4000 HP today with all the technological advances that have been made. FM/ALCO no longer builds new 251 blocks as I recently learned. You might as well forget meeting "Tier" standards of any level due to that alone. The best hope is rebuilding existing blocks which may allow for "grandfathered" emissions standards. mtuandrew wrote: Re: castings, I'd be more interested in welding up a truck frame that looked like a casting. It'd be a matter of ordering the right bar stock (looks like 2" x 8" or 2" x 10" at maximum depth? ), sub-arc welding it into a rough approximation of the DL-109's equalizer bar shapes, water-jet-cutting it to the exact shape via CNC, and finishing it with a good heat treatment. Any idea how difficult it is to do large high presion weldments like that? It's not trival and would take a decent amount of engineering in additon to the shop/machinery requirements. Probably not going to SAW weld too much either since that process doesn't work well on fillet, complex shape or out of position joints. The amount of metal you'd have to remove and the complexity of the machining/programming to do detail finish work in order to trace the profile you want would be quite substanital as well. Not going to be any more economically practical than a custom casting. Might be able to cast the side frames and then weld them up into the final frame assembly - indiviual side frames would be simpler and smaller castings to make, and then welding up the interior structure would be much more practical than the entire assembly and cosmetic machining. Truck frames for diesels are one thing, but what about the one-piece bed-frames for steam locomotives? (*). The people behind the project to build a new Pennsylvania Railroad T-1 apparently think they can manage: I think by welding. So apparently at least some people think modern welding technology IS capable of reproducing traditionally cast parts of big locomotives. (*). Since this IS a string on new built Alcos... I will record my personal feeling that I wish the people behind the PRR T-1 project had had the good sense instead to try to create..."New York Central 5475." Or maybe "New York Central 5501." Alcoman wrote: FM/ALCO no longer builds new 251 blocks as I recently learned. You might as well forget meeting "Tier" standards of any level due to that alone. The best hope is rebuilding existing blocks which may allow for "grandfathered" emissions standards.